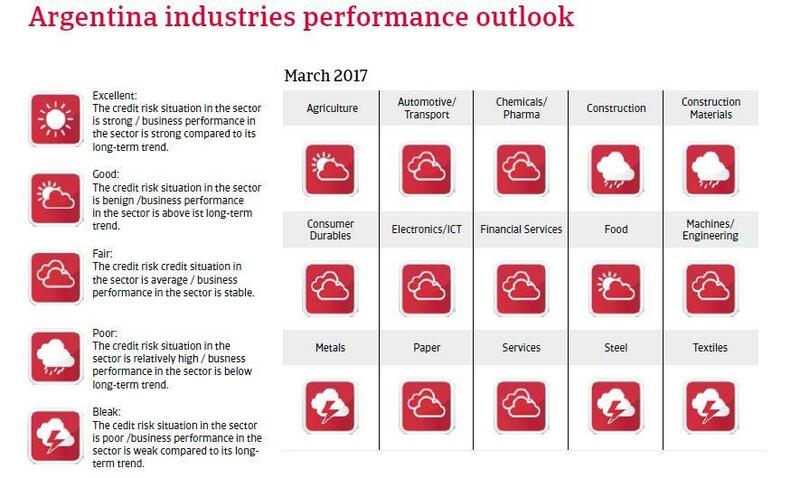 While the return to more market friendly policies has improved medium- and long-term growth prospects, the short-term outlook remains challenging. Since his inauguration in December 2015 President Mauricio Macri has addressed the important economic issues left by the former government (e.g. debt default and highly interventionist policies) by cutting energy subsidies, abolishing export taxes, lifting capital and currency controls and floating the (overvalued) Argentinian peso. In early 2016 Argentina negotiated a debt deal with remaining holdout creditors, which enabled the country to exit default and to return to international capital markets. Those measures have improved the economic relationships with the IMF, the US and Europe. However, the government still lacks a majority in the Chamber of Deputies and the Senate, which means that Macri has to cooperate with the opposition in order to assure parliamentary majority for reforms. At the same time, the cut of subsidies and fiscal austerity policies have led to mass protests, and public support for economic reform has decreased, while mid-term elections are due in October 2017. 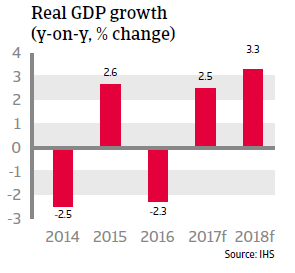 In 2016 GDP contracted by more than 2%, due to one-off effects of president Macri´s economic policy turnaround, an on-going recession in Brazil (Argentina´s main trading partner) and low commodity prices. Inflation increased to over 35% in 2016 due to a massive peso devaluation of more than 30% after the decision to float the peso and subsidy cuts. Many Argentine households were severely affected by those cuts and by sharply increased consumer prices. 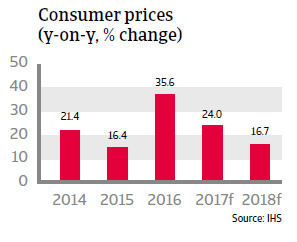 Inflation is expected to decrease again in 2017 and 2018, while economic growth will return, helped by improved financial conditions after the country regained access to international capital markets and a more benign external environment. 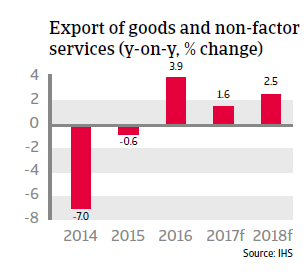 However, while peso appreciation should sustain export growth, this upswing could be severely dampened by any additional US import tariffs and any disruptions in global trade flows. While the return to more market friendly policies has improved Argentina´s medium- and long-term growth prospects, the short-term outlook remains challenging. Fiscal consolidation is slower than anticipated due to political considerations and social pressures (see above), with annual deficits expected to remain above 5%, and with government debt rising further. The government debt structure (51% financed externally in foreign currency) makes public finances vulnerable to exchange and refinancing risks. For the time being, strong demand for Argentine debt mitigates those risks. Argentina´s resilience to economic shocks remains limited due to continued low official reserves. Although liquidity has improved following the issuance of international bonds, it remains tight and is insufficient to cover gross external financing needs. This will keep the peso vulnerable to shifts in market sentiment. Structurally Argentina´s economy remains vulnerable due to its high dependence on commodities (agricultural products account for 50% of exports), a relatively high stock of inward portfolio capital (147% of official reserves), weak institutions, the issue of government finances and its history of debt default. For the time being, many Argentine businesses will continue to face higher liquidity risks due to volatile credit markets, an uncertain political and economic environment, uncertainty over global bank loaning capacity, and a weak local currency, which is susceptible to further devaluations that could immediately increase debt leverage - especially for companies that hold significant foreign currency debt while generating revenues in local currency.